This might sound a little surprising, but my family actually got our start with Budgeting through Minimalism! We started on our journey with Minimalism after I came across, my now good friend, Allie Casazza + her life-changing course Your Uncluttered Home. I quickly learned that Minimalism spills into every aspect of your life. It’s about decluttering and simplifying your home, your calendar, your relationships, and even your budget! There are so many benefits to living a simplified clutter-free life, and gaining financial freedom is one of them! So I want to share a few ways that you can declutter + simplify your budget! Just like household clutter, financial clutter can also steal your joy and your peace of mind. You've got to start somewhere with your budget declutter, and I recommend starting with purging your old mindsets about money + budgeting. A budget isn't any more restricting than having a cleaning schedule or a to-do list. I want you to break free from your old mindsets about budgeting and realize that it's simply about telling your money where to go on paper. It's about being intentional with your money, creating a plan for it, and sticking to it. It's about learning to make your money work for you, not the other way around. Just like a household declutter, you've got to throw out what you don't need, and then sort + organize everything that's left and get it in one place. You'll want to gather up all of your bills, receipts, statements, check stubs, etc, and put it all in one big binder. I keep a 2" 3-ring binder with several dividers to keep me super organized. Everything goes in this one place so nothing can get lost. 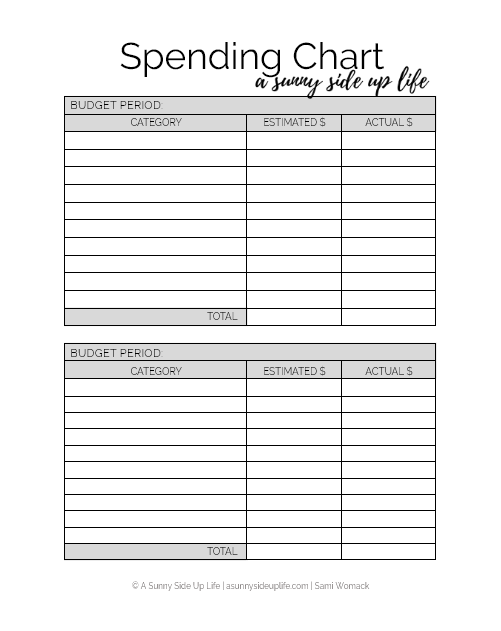 Inside this binder you'll also want to keep all of your Budgeting Worksheets where you can easily find them. Again, just like managing your household clutter, you'll want to establish a rhythm + routine for keeping your budget clutter under control as well. You'll want to have a designated spot for your incoming mail + paper bills. I personally put mine in the front pocket of my Budgeting Binder so they don't get misplaced. Then, you'll need to establish a rhythm for when to pay bills, update your budgeting worksheets, and check-in with your spending allowances. I recommend sitting down a few days before payday (the more in advance the better) and making a plan for your paycheck before you even get the money in your hands. This takes the guess work out of payday, and sets you up with a great plan ahead of time. Then, you'll want to sit down again with your budget first thing on payday before you have a chance to frivolously spend any money. On payday you'll want to pay all of your bills first, then set aside your spending allowances (for things like gas, groceries, fun money, etc) in either a separate bank account or in cash, and then any leftover money should be applied to paying off debt or be transferred into savings. After payday, you'll want to check-in with your budget frequently during the budgeting period. Beginner budgeters might want to check-in with their budgets every single day until they start to feel more comfortable, and eventually you can move to just checking in every few days or once a week. During a budget check-in you'd want to check off your bills when they clear your account + update your spending totals to make sure they're still on budget. Getting your accounts organized is a huge step in this decluttering process! I keep this part of my budget very simply because I believe that organized clutter is still clutter. 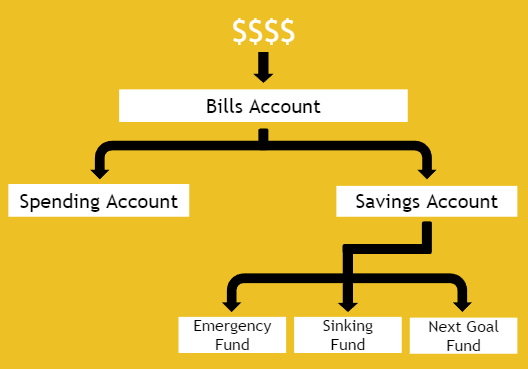 In your Bills Account you would only leave enough money to pay all of your bills for the current budgeting period (until the next payday)...plus you could also leave a small buffer ($10-$100) just so your bank account never has to hit $0. In your Spending Account you would only transfer over (or withdraw in cash) how much you were allowed to spend for the current budget period on things like your gas/fuel, groceries, restaurants, fun money, etc. In your Savings Account you would only keep your emergency fund, savings for your next goal (like cash-flowing a vehicle or a vacation), and your sinking fund money (for things like holidays, maintenance fees, or other irregular expenses). Some people like to keep these savings fund in 3 separate accounts and others like to keep them in 1 account and just simply organize that money on a worksheet...this is completely a personal preference. Like I mentioned above in Tip #4, you'll want to keep your spending money separate from your bills money, this is a huge step in decluttering your budget. This cuts out the guess work on how much spending money you still have left, you never accidentally spend the electric bill money on groceries, and it keeps everything in one nice neat place. Once you have your spending money in one place then you have to decide how you'll spend it. This is where you'll want to split your spending allowance up into categories. I recommend keeping this step as simple (and clutter-free) as possible. I personally only use about 3-5 spending categories regularly. For example: gas/fuel, groceries, restaurants, fun money/extras, date night, babysitter, travel, pet care, etc. Customize your categories to fit your real life, and only use what applies to your spending habits. If you're using a debit card account you can simply organize your spending allowances for each category on a worksheet, in a notebook, in the notes on your phone, or with an app. And if you're using cash then the Cash Envelope System will be your best friend...which basically just means that each spending category gets its own envelope so the money stays nice + organized. Then you'll want to track your spending by writing down (hand-written or digitally) every purchase that you make and keeping a running total for each category. This will keep you aware of your spending + help you stay on budget. >> Want to learn more about Taking Control of Your Spending? Sign up below for my FREE 5-day email course!
. This helps you rest assured that all of your bills are either paid or that the money will be available for any charges that are still pending. When organizing your Bills Account you'll want to keep a master bills list for reference, or what I call a "Bills Overview Chart". This is a list of all of your bills in due date order with a short description and an estimated amount due. You'll want to refer back to this Bills Overview Chart every budget period to make sure that nothing gets forgotten. Another handy tip is to use a calendar specifically for your paydays and bill due dates. This will help you get a better visual on when money will be coming + going into your account. When your bills are simplified + organized you'll feel more comfortable just paying everything on payday or setting up automatic payments because you'll know that the funds will actually be available. Also, if you find your bills consistently falling at inconvenient times you can consider rescheduling your due dates to something that fits into your budget more easily. If you're wanting to overcome the overwhelm of setting up a family budget, reaching your money goals, + getting serious about your financial future, this guide will help you break free from the chaos. My full Budgeting Course, Your Sunny Money Method, is exactly what you need! In terms of household clutter, Debt is like the catch-all closet that you use as a dumping ground for random junk and make sure it never gets opened in front of company. Simplifying your debt can be pretty painful...trust me, I've been there with my own $490,000 worth of debt. It hurts to see that total for the first time, but decluttering this part of your budget will bring you the most peace of mind...and it's actually pretty simple to do. You'll want to gather up all of your debt info from either your paper statements or from your online accounts. Then you'll want to organize your info, and for that you'll need a short description (name of credit card, student loan, car, medical bill, etc), your current total owed, your interest rate, and your minimum monthly payment. Once you have all of this info gathered up, you'll want to line up your debts from smallest to largest balance (or in the order that you intend to pay them off). Once you're all organized, you'll want to find your debt free date. This can be done by hand, with a number of online calculators, or with my favorite resource The Debt Snowball Calculator. This auto-calculating spreadsheet can help you plug in different monthly payment amounts to calculate your debt-free date. I highly recommend this amazing resource for simplifying your debt! You probably have tons of dreams + goals that you want to accomplish floating around in your head, but as Benjamin Franklin said, "Failing to plan is planning to fail". This means that if you want to actually accomplish something you're going to need a plan! First of all, you'll want to take that cluttered up list of dreams and make a simplified list of goals. You'll want to write down a realistic list of goals with a short description, money amount, and a date of when you want to accomplish them. If you're married you'll want to make this list together with your spouse by taking turns writing down goals + making sure each person is heard with their dreams. The key to turning a dreams list into a goals list is actually creating a plan for accomplishing these things...not just sitting back + waiting for them to happen. This is where you'll want to make a plan for the future. Don't be afraid to make a rough estimate several months or years into the future of how much your paychecks, bills, and leftover money will be. Once you have a good idea of how much extra money you'll be able to throw at debt or save, you can estimate when you'll be able to accomplish some of those goals on your list. Even if the numbers aren't perfect or they end up changing later, just getting these estimated numbers written down will give you so much peace of mind. Look, I once sat right where you’re sitting...I totally get it! I was up to my eyeballs in household clutter (3,200 sq. ft. of madness), financial clutter (a half-a-million worth of debt), and emotional clutter (depression, guilt, and lack of motivation). I decided I was sick and tired of living in survival mode, and that I wanted more out of my life! I wanted to live the abundant life I had always dreamed of! I took control of my life...and you can too! I've spent the last 3 years trying + testing all of the best budgeting methods to get my family out of some serious debt. Now, I spend my time coaching other women through their families' budgets! Together we'll work on all of these topics listed above + more in my full budgeting course, Your Sunny Money Method.